X-Tronic 1600-XR3 is a commercial ornament cleaner. It has two-liter water tank capacity, the steam regulating method by foot accelerator and gun spout, washing funnel. Moreover, it has the steam gun with 48" hose, side gun holder etc. By using this industrial/ commercial jewelry steam cleaner machine, you can clean any kinds of jewelry. Not only that, you can provide professional service by using its superior steam generating capacity. It can produce 70 PSI steam pressure. Let's have a details review of the X-Tronic 1600-XR3 in details. Furthermore, if you have any question or query, please contact us through our contact page or comment below. What is X-Tronic Model #1600-XR3? Why you buy this X-Tronic Model #1600-XR3 steam cleaner? 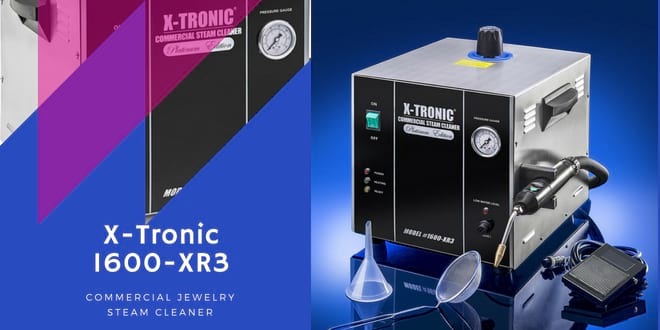 X-Tronic 2 Liter Steam generating device is an industrial grade cleaning device which runs by producing steam pressure. It is made of stainless steel. It can use 8 hours per day easily and can continuously generate steam for up to 4 hours. Not that all, let's have a broad look. Powerful Steam Generating Capacity: It can generate 70 PSI steam pressure. This quality steam pressure is very effective to clean any kinds of dirty elements from any form of Precious jewelry. You will able to clean industrial diamond, platinum, silver, gold etc. jewelry in a proper way. All commercial features: This machine has all kinds of a commercial feature. Outlook to water tank capacity, everything made up considering professional user. So it should be a natural choice for any jewelers. Easy Lift Carrying Handle: Its lift carrying handle make the transporting process easy for users. 15-minute heat up time: It can work fast. It takes only 15-minute time to heat up properly. Big sized boiler: The boiler is big and can hold 2-liter water at a time. So you will not face any problem with your professional work. Stable Outlook: Outlook is very standard. It is made of stainless steel. Its mainstreaming unit & boiler Tank also made with stainless steel. You can buy it for use in the professional sector. Not only that, you also can use it for personal activity. Furthermore, here you can check other jewelry cleaner reviews. 6. Comfortable conducting handles on both sides of the device. Best for Commercial use. You also can apply this one for home use. Here we are providing the date what we liked about it and what we didn't like of it on the chart table. 5. You don't need to use liquid solution with it. 1. It is a little bit expensive device. 1. Will I able to do all of the professional cleaning work with this machine? Answer: Yes, you can professionally clean all of the jewelry ornaments using this device. 3. Is it recommended for diamond and gold cleaning? Answer: It is a professional device and perfect for cleaning almost all type of gems including diamond and gold. Its overall performance is excellent. We hope you will like its steam generating capacity. Though its price is high, considering the performance it is OK. You can use it for professional use. If you have a jewels house, it is perfect for you. We tried to include all information related this product. If you have any further query, hit in the comment box. You also can let us know if we miss any point.